Most of us remember that kind-hearted, gentle, soft-spoken man who invited us into his neighborhood each day. Suddenly, we weren’t sitting in our living room watching TV. We were transported to his world where we were surrounded by puppets, trains and kindness. We learned that kids matter and are worthy of love and acceptance. We learned about anger, trust, courage and sadness. Rogers, an ordained minister, used media to teach kids about morals. 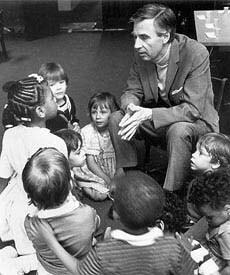 Motivated by the way television addressed children, Mr. Rogers set out to change how people viewed children. Over 3 decades, he became an icon to some and a friend to millions. “Anyone who does anything to help a child is a hero to me." We learn the importance of love in our families and relationships. The early church was a great example of this sacrificial love. They met together and immediately started meeting needs. They even sold property and possessions to give to anyone who had need (Acts 2:44-45). It was an example of love in action. Our children are watching and they notice whether we love others—in words and actions! Jesus is the prime example of this kindness. In love, He laid down His life for us. While we were sinners and completely undeserving of mercy, Jesus died for us. As our passage today points out, He calls us to be sacrificial toward our brothers and sisters in need. That is how God’s love is shown to others—in actions and truth! Dear Lord, help us to love the children. Help us to find ways that we can love them and show them Your love. In the Name of Jesus, Amen.